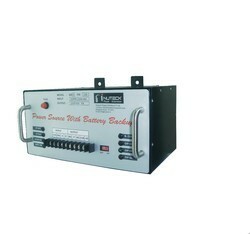 We are instrumental in offering our esteemed clients a wide range of Battery Backup Unit. This range comprises of Adapters, Battery Chargers and Voltage Regulators. Our team consists of diligent professionals, develop this range using best-in-class raw-material, in compliance with the industry laid parameters. In order ensure its optimum performance, robust construction and high durability, this range is widely appreciated in the market. 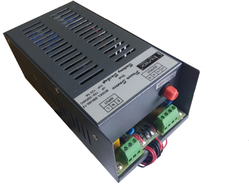 Catering to the requirement of our valued clients we are associated with the manufacturing, exporting and wholeselling of Battery Backup Units. Manufacturing of the BBU products is executed with the help of superior quality raw material in order to ensure its optimum performance and high durability. Our valued clients can avail these excellent BBU at a market leading price with the certainty of on-time delivery. Auto Change Over I/P Under Voltage Cut off 110 VAC Under voltage Cut off = 80VAC +/-10VAC and Recovery =90VAC +/-10VAC After cutoff o/p automatically change over on Battery. I/P-230 VAC Under voltage Cut off = 160VAC +/- 10VAC and Recovery =175VAC +/-10VAC After cutoff o/p automatically change over on Battery. Looking for Battery Backup Units ?